Their names are inscribed on a Birthplace Marker located near the site of the original building on the south side of 4th Street SW, near Madison Street on the mall in Washington DC The marker was officially dedicated on Sept. 9, 1951, and is the only private monument on the mall. The 11-story landmark National Grange headquarters building in Washington, D.C. was dedicated by President Dwight D. Eisenhower on June 29, 1960, and is the only private edifice in a federal block across from the White House. It serves as a non-governmental headquarters for agricultural and rural families. A professional staff administers policies established annually by democratic Grange processes at local county, and state levels. 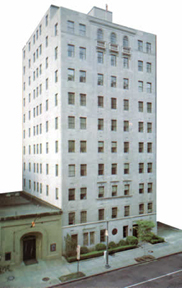 Built in 1957, the original headquarters was located on Lafayette Park. A video of our 50th Anniversary Rededication is coming soon. Please check back to enjoy the program.